The Alesis PA System in a Box includes a 4-channel powered mixer with a powerful 280-watt (peak power) amplifier, two 10-inch 2-way, high-output passive speakers and two 20-foot speaker cables--- everything you need for great sound reinforcement, all in one box. 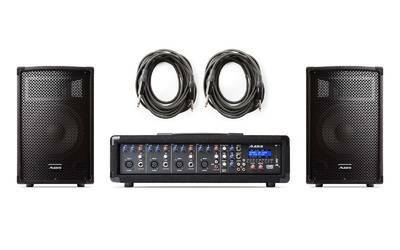 It`s perfect for anyone who needs an affordable but complete mobile PA system for a small venue, rehearsal space, presentation, ceremony, house of worship or sporting event. The included PA80 4-channel powered mixer features a balanced microphone XLR input, an unbalanced quarter inch line input, 2-band EQ, and a FX level control on each of the 4 channels. There is also a 3-band master EQ, as well as a master level, time, and a repeat control for the built-in digital delay effect. The powered mixer has 280 dynamic watts of power on hand (80 watts continuous), and provides the system`s speakers with abundant power for exciting room-filling sound. There is also an RCA input for playing back songs from your mobile device, as well as an RCA output for connecting to a portable recorder. If you need additional inputs, there`s an additional quarter inch line input and quarter inch line output for connecting other external devices.